The world-renown Clarke School for Hearing and Speech contacted All Noise Control for our specialized help in resolving a noise pollution problem they were experiencing. Clarke School needed suggestions on what to use for their project. They needed something that would prevent echoing within the room, while also prevent vibration noise troubles in large place in addition to preventing noise from escaping the room in which it was intended. The Clarke School was founded in 1867 in Northampton by Gardiner Green Hubbard, whose four-year-old daughter, Mabel, became deaf from scarlet fever. When he sought education for his beloved daughter he was advised by many that this was a waste of time. Mr. Hubbard, instead, believed that given the right environment his daughter could speak and learn just like other children. Hubbard hired a teacher to work with Mabel on her speech and language. At age 10, Mabel did as well in the classroom as any of her hearing peers. His vision was used to launch the Clark School. The institution provides children who are deaf and hard of hearing with the listening, learning, and spoken language skills they need to succeed. Annually, more than 800 children and their families benefit from programs and services at their five campus locations: Boston, Jacksonville, New York City, Northampton and Philadelphia. When they were faced with a noise control issue that was impeding their work, the Clarke School felt 100% confident that the professionals at All Noise Control would be able to provide customized product recommendations that would fit their unique needs. 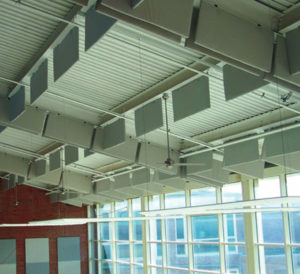 All Noise Control has been supplying and custom manufacturing a wide selection of cost effective, high-presentation acoustic products for noise control in commercial, industrial, institutional markets for close to twenty years. All Noise Control has been front-runners in delivering specialized noise control materials solving virtually any noise control concern. Our reputation for providing quality, customized solutions at a good price is well known in the industry. The solutions we have provided for our many satisfied customers include improved acoustics for theater, broadcasting and audio studios, sound solutions for churches and even blocking noise in industrial plants, heavy construction sites, outdoor enlarge applications and others to many to list. The main objective of the project was to avert the echoing, and to prevent sound exposure noises. Clarke School was a big and very important job to All Noise Control. In short order, the experts at All Noise Control had a resolution to the noise pollution that was easy to implement and affordable. All Noise Control informed Clarke School with the product that would help prevent their issue: Acoustical Ceiling Baffles. These would eliminate built up sound due to noise reflection, in other words the echoing, and sound exposure. With the Acoustical Ceiling Baffles in place the noise would be dramatically reduced. The Acoustical Ceiling Baffle (ANC-600) is best in situations where it is required that baffles have a “crisp” corner and a finished face. This makes our ANC-600 ceiling baffles have an aesthetic finished look as well as superior noise control and sound absorption properties. The ANC-600 ceiling baffle is 1 ½ ” thick in standard 2’x4′ sizes. They are available up to 4′ x 8′ for larger applications. Our Client, Clarke School, is extremely pleased with the results! The vibrations, echoing, and the excessive sound exposure have been prevented, effectively eliminating their problem. The space can be quieter where needed with improved sound quality in areas where required. The families and children the Clark School is dedicated to serving can concentrate and learn in a more in a peaceful environment. If you would like us to evaluate the specific sound control and isolation issues you are having, please contact our Customer Service Department at 561-964-9360.